DMAIC is an acronym of Define, Measure, Analyse, Improve, Control. 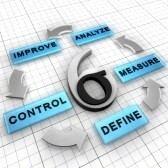 Which means a 5 step method the heart of the Lean Six Sigma approach. Identify customer needs, clarify goals, describe the project scope. “Define” is the first step of the method. It allows to define project size, deliverables, resources and time needed. Collect representative data, measure performance, identify areas for improvement. Assessment of the current performance and its variation (trend, cycle…). Use of analytical and statistical tools to identify the causes of problems. At this stage of development of the method, we must understand the issues in order to formulate eventually the solutions that bridge the gap between the today situation and customer goals. Identification and implementation of solutions to avoid the identified problems. This particular phase is particulary important and, in some specific cases, it can be splitted in several stages. This helps to take the time to test and validate the most appropriate solutions. Tracking solutions implemented. It is important to avoid step-back. On the other hand, the results are not always immediately visible. The effort must be sustained or reoriented. This is the most delicate phase and common to all continuous improvement initiatives. Step-back is a threat at all times. Support the effort necessarily involves the introduction of a widespread culture of measurement.